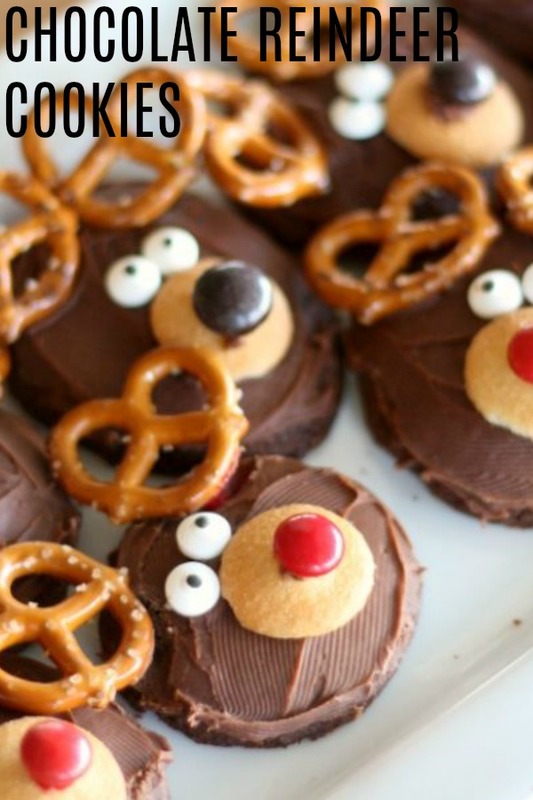 I love these Chocolate Reindeer Cookies. They are so festive and easy to make. I love getting my little ones involved when I make these. Christmas is upon us, and Santa is packing his sleigh. I am in love with Christmas baking and cookies for the neighbors and Santa. I found these on Pinterest and just had to make them because they are adorable. These cookies are fail proof, and your kids can even help you decorate them. Merry Christmas. where can i find the candy eyeballs? These eyeballs make the entire cookie. They are so cute, and add so much personality. These are found on the sprinkle aisle, at every grocery store. They are usually on the same aisle as the cake mixes and the frosting. They are very inexpensive, and go perfect with these. And yes, they are edible. If you can’t find the candy eyeballs, you could also just use black frosting and do two small dots for eyes, and they would be just as cute. what could i use instead of m&m’s? looking for a homemade chocolate frosting recipe? If you are looking for a homemade chocolate frosting recipe, look no further. We have go you covered. Our love language is chocolate frosting, so we have almost perfected our chocolate frosting recipe. Our Chocolate Buttercream Frosting recipe has amazing reviews, and the most amazing taste. You may just want to hide the bowl from the kids, and lick it by yourself. Can’t say I haven’t done that. Check out the recipe, here. Roll dough into 1-inch balls, making sure they are all similar in size. Frost the cookie with chocolate frosting. Place on the vanilla wafer for the reindeer snout. Stick the M&M nose on the wafer with a small dab of chocolate frosting. Place the pretzels on for the antlers. And then place the edible eyes on just above the wafer cookie. These are so cute. Love it!! Kisses from http://poshnessary.com ?